John Yu is a distinguished paediatrician. He was appointed Chief Executive Officer of the Royal Alexandra Hospital for Children in Camperdown in 1978 and was the driving force behind its relocation to a new building in Westmead in 1995. Yu served as the Chancellor of the University of NSW from 2000 to 2005 and is an expert on the decorative arts of Southeast Asia. He was appointed a Member of the Order of Australia in 1989 and was named Australian of the Year in 1996. In 2001 he was appointed a Companion of the Order of Australia. Born in China in 1960, Chen now lives in Queensland. 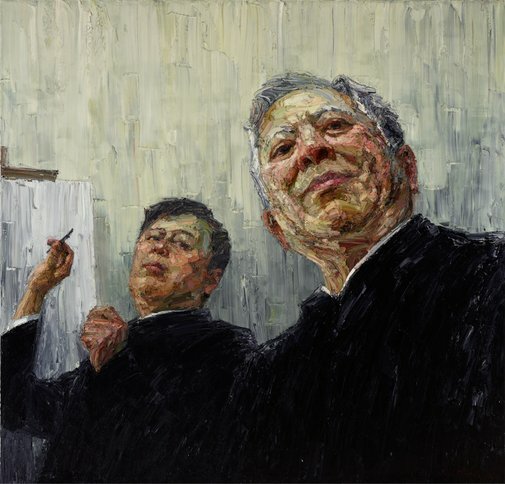 He graduated from the Guangzhou Academy of Fine Arts in China in 1986, then worked for four years as an art editor in book design and as a fine arts lecturer. During this time, he entered many art competitions, winning several prizes. He came to Australia in 1990 and graduated with a Master of Fine Art from the Queensland University of Technology. He has exhibited in many solo and group shows throughout Australia. He has been a finalist in the Sulman Prize three times and was a finalist in the 2009 Wynne Prize. He has had portraits hung in the 2006, 2008 and 2009 Archibald Prize.